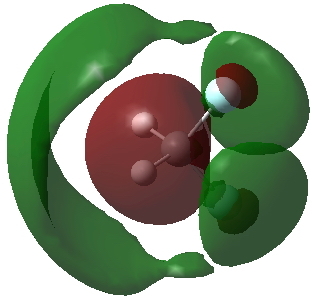 The electrons on carbon could expand the octet shell by populating molecular orbitals constructed using 3s or 3p atomic orbitals (AOs) as well as the normal 2s and 2p shells. This is also the normal "explanation" for expanded octets, the assumption being that as one moves down the rows of the periodic table (e.g. P, S, Cl, etc) these shells become energetically more accessible (e.g. the 3d or 4s shell for P, S, Cl etc). In fact, for e.g. 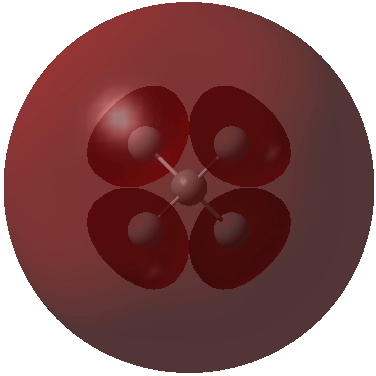 PF5, the occupancy of such "Rydberg" shells is only ~0.2 electrons, not a significant octet expansion. The electrons can instead or as well as populate the antibonding molecular orbitals (MOs) formed from just the 2s/2p AOs. For a methane derivative, there are four bonding MOs (into which the octet of electrons are placed) and four anti-bonding MOs all constructed from the total of eight AOs. Well known examples of populating antibonding MOs are the series N≡N, O=O (singlet), F-F, Ne…Ne where the additional electrons are added to anti-bonding MOs and have the effect of reducing the bond orders from 3 to 2 to 1 to 0. And of course all core shells contain populated bonding and antibonding pairs. Here are some ωB97XD/Def2-TZVPPD/scrf=water calculations. All these species are molecules with all-real vibrations, being stable toward dissociation to e.g. CH3– + H– or CH3– + F–. A transition state for this latter dissocation with IRC can be characterised. In all cases the energy of the highest occupied MO or NBO is -ve, meaning that the electrons are bound, at least in part due to the solvent field applied. 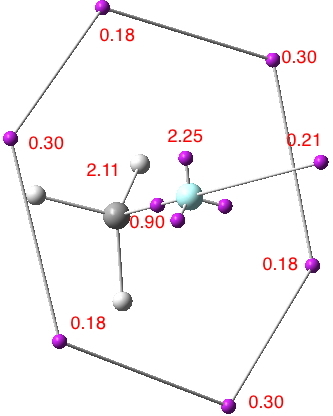 CH42- shows only small Rydberg occupancy (< 0.2e), but a significantly reduced bond order for the four C-H bonds (each C-H bonding NBO also has some antibonding character for the other three CHs) and hence the molecule is not truly hypervalent. CH3F2- in contrast shows quite different behavour. The C-H bond order is almost 1 and the C-F bond order is actually >1. Of the two extra electrons, ~1.28 now occupy carbon Rydberg AOs and the fluorine also has significant Rydberg population (~0.36e). So this is a real hypervalent system, in which the total valencies exceed that expected from an octet. CH2F22- is somewhere inbetween the previous two systems. The carbon has modest Rydberg occupancy (~0.4e) but there is also significant occupation of the antibonding MOs. Both the C-H and C-F bond orders are <1. CF42- shows a further reduction in the C Rydberg occpancy (<0.2) and the C-F bond order is also reduced. This reduction in bond order is also seen in other so-called hypervalent systems such as PF5. So of these systems, CH3F2- can be reasonably called hypervalent, whilst the others have much less such character. 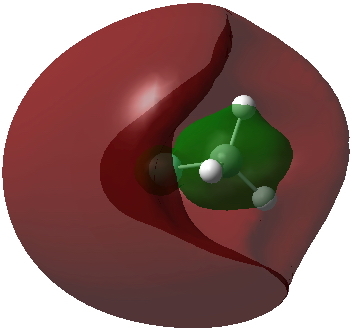 It does appear that there is a fine balance between placing extra electrons into Rydberg orbitals to expand the "octet" and hence valencies, and placing them in anti-bonding orbitals where the individual valencies are actually reduced. It seems that substituting methane with just one fluorine encourages population of the Rydberg orbitals, but that more fluorines encourage instead population of the antibonding orbitals. What is remarkable is that CH3F2- actually has a (small) barrier to dissociation. The challenge now is to try to design a system which has a significant Rydberg population, a low antibonding population AND is stable to dissociation; this will require some inspiration. So do not hold your breaths! This entry was posted on Sunday, February 21st, 2016 at 7:23 pm and is filed under Bond slam, Hypervalency. You can follow any responses to this entry through the RSS 2.0 feed. You can leave a response, or trackback from your own site. Another way of analysing what the electrons are up to is the ELF (electron localization function). That for CH3F2- is shown below. Note the existence of six "Rydberg" basins, integrating to 1.44e, and located some distance away from the atoms. These are the electrons contributing to the expanded octet. The “unexpanded” shell surrounding the carbon integrates to 7.23e, a “normal” octet.